Today I have some cards to share that were posted to the MME Blog last Friday. When I saw these 4x6 journal cards from the Record It! "Here is Happy" collection, I fell in love with the sentiment of them!! They are sweet & encouraging & really can stand alone....which is one of the things that makes them perfect for Project Life & scrapbooking. As a card maker, I REALLY wanted to find a way to use them as well, but their size posed a bit of a challenge. I didn't want to cover them up or cut them down much...so I decided to make the cards the main focal point of each card, and go with a really clean design. Check them out! Supplies: My Mind's Eye Record It! "Here is Happy"- Cardstock and Overlay Journaling Cards, Enamel Dots. Other: May Arts ivory twine. I trimmed each 4x6 card down so they would fit on a standard A2 sized card, then rounded the corners as needed. After adhering each journal card to the card fronts, I added some matching enamel dots as accents. This gave each card a little bit of added dimension & a pop of shine. I then tied double bows from ivory colored twine from my stash & attached them to each card front...and that is it!! So easy & quick, but still looks fabulous! I don't know about you, but I sometimes need the reminder that simplicity is a good thing...and these beautiful journal cards really helped me remember that! Thanks for checking out my cards today!! Hey there, blog friends!! Long time no post....I know, I know. My trip to Montana was wonderful, but I was definitely ready to be home!! Since then I've just been trying to get back into the swing of things. 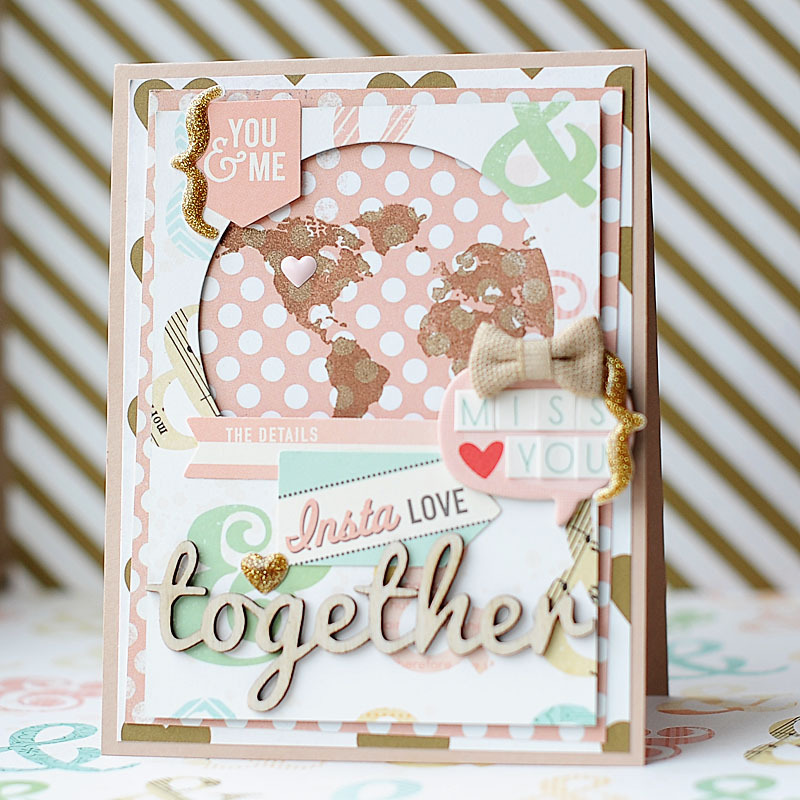 Awhile back I was asked to be part of the Scraptastic Kit Club design team, and this is my first month using the kits! 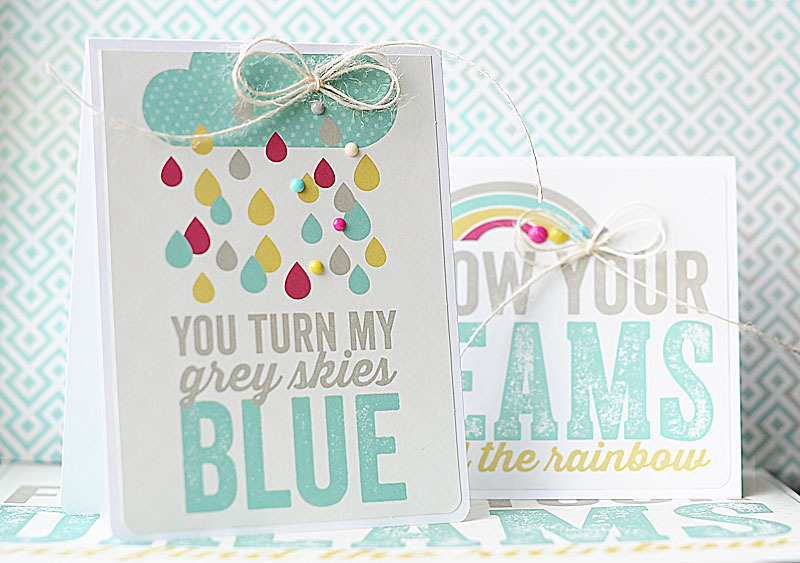 I am up on the blog today with fellow designer Roree, and we have issued a new challenge - create a Miss You card with one of the April stamp sets from Worth Wondering, Let Me Go, or This Life Noted. I found inspiration for my first card from Sketch Saturday #305. I loved the circle in it, and decided I wanted to use it with negative space. I used a pink, mint & gold color combo....which has been one of my latest faves!! I used the Worth Wondering Kit and Add-on on both of my cards today. Check it out! 1. 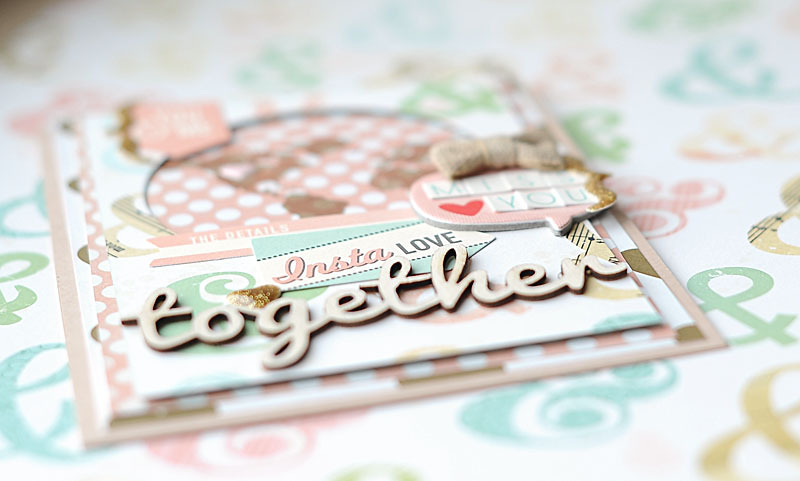 Make A2 card from light brown cardstock. 2. Cut three blocks of patterned paper, each one slightly smaller than the one before. 3. Diecut a circle from the top of the smaller block. 4. Stamp the world to the top of the middle block so it will peek through the diecut circle. 5. Layer all three paper blocks to the card front, popping the third one up with foam adhesive. 6. Add the diecut tags & tabs to the top & bottom of the circle. 7. Add the letter stickers to a chipboard speech bubble, then adhere to the right side of the circle. 8. 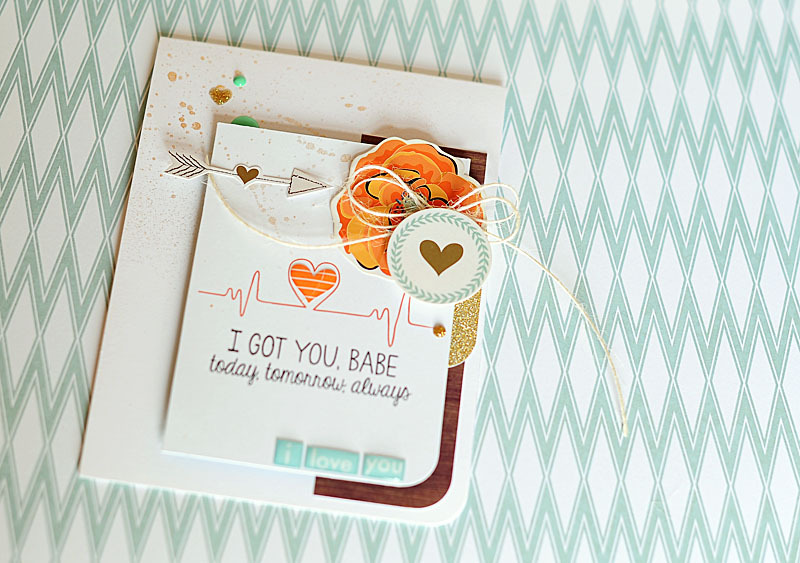 Add the wood veneer "together" to the bottom of the card. 9. 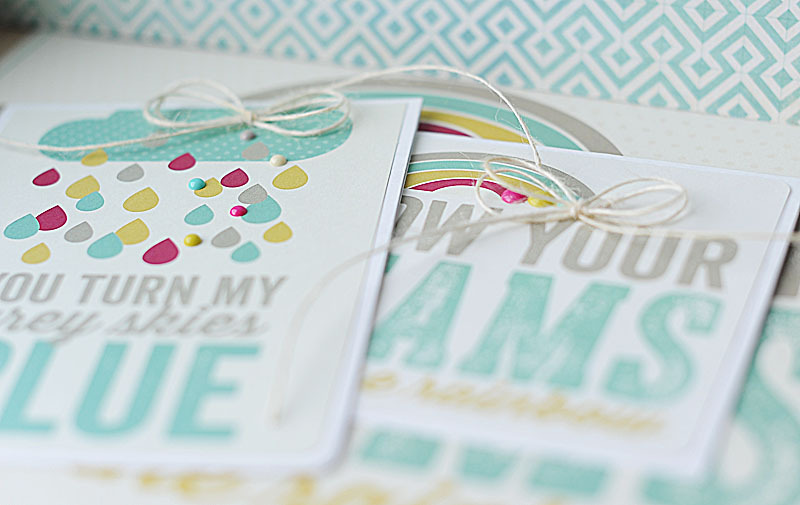 Accent the speech bubble with a fabric bow, then add enamel stickers to the card to finish. For my next card I used the Viva la Verve April week 2 sketch, but just flipped the rotation of it! I cut the flowers & leaves from one of the My Mind's Eye patterned papers in the kit, and I love how pretty they are! 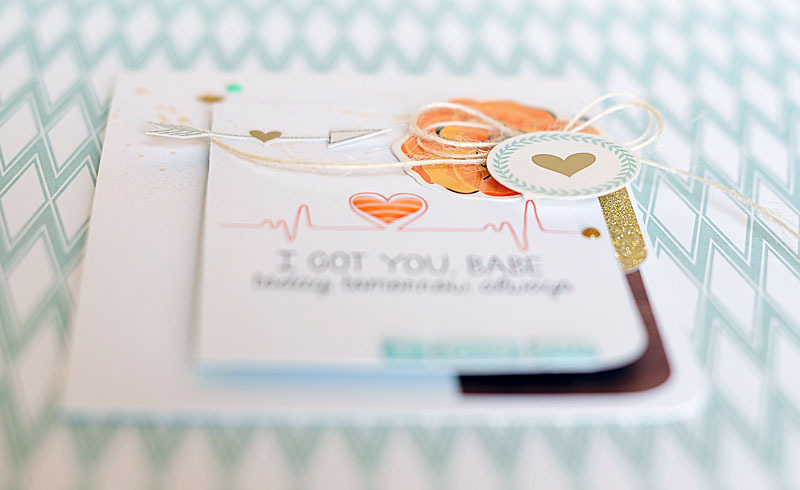 They are easy to layer and add dimension to your card. 1. 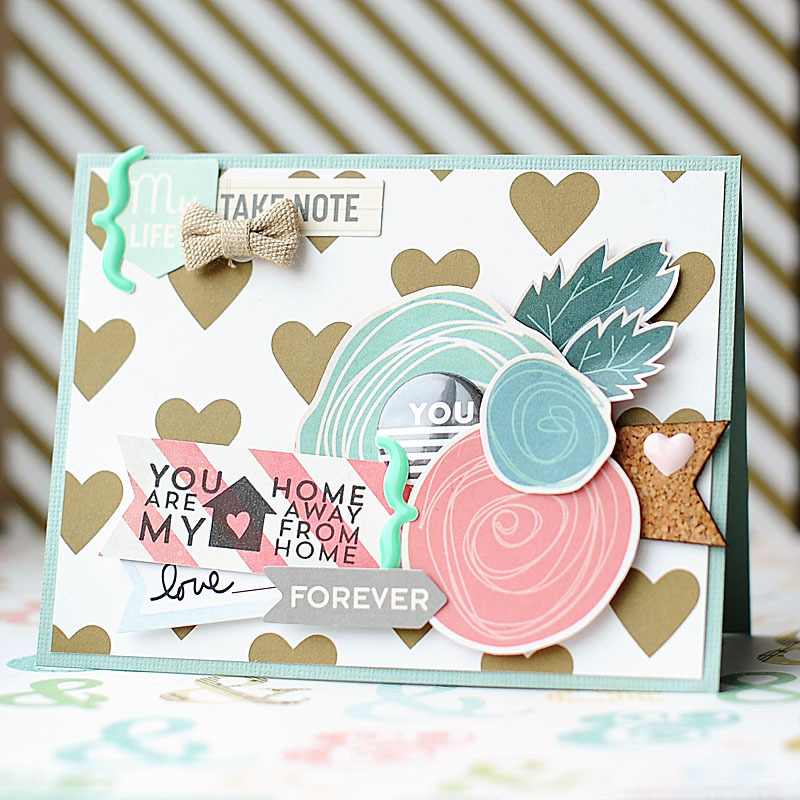 Make A2 card from mint green cardstock. 2. Cut heart paper slightly smaller & adhere. 3. Cut three flowers & two leaves from patterned paper. 4. Layer the flowers, leaves & cork banner to the front of the card. 5. Tuck the flair into the middle of the flowers. 6. 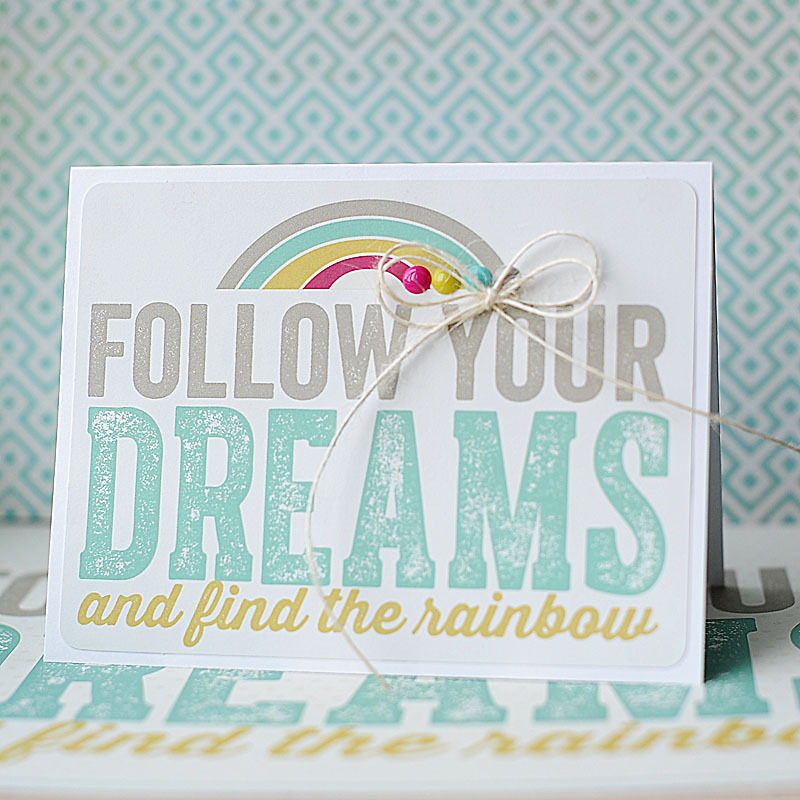 Stamp the sentiment to a striped paper strip, then cut a banner edge to it. 7. Tuck the two banners under the left side of the flowers, then add the "forever" arrow to it. 8. Add the diecuts to the upper left corner, then accent with a fabric bow. 9. 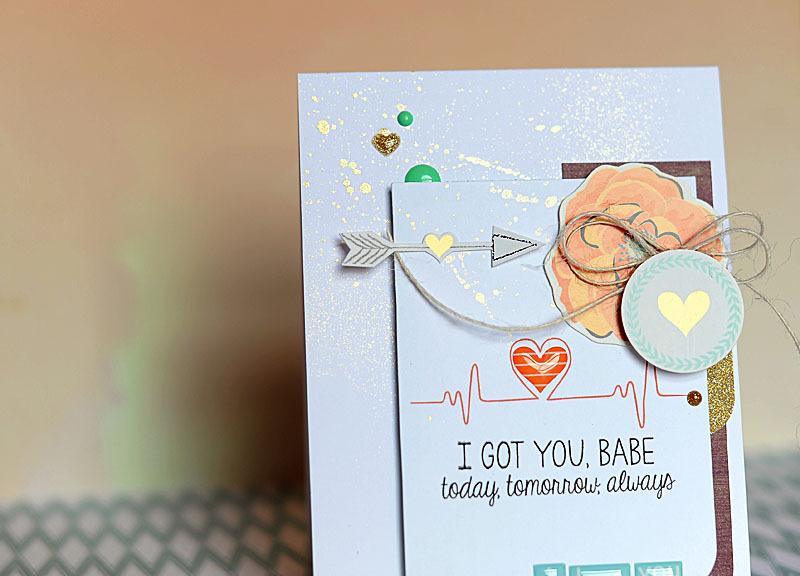 Accent the card with enamel stickers to finish! 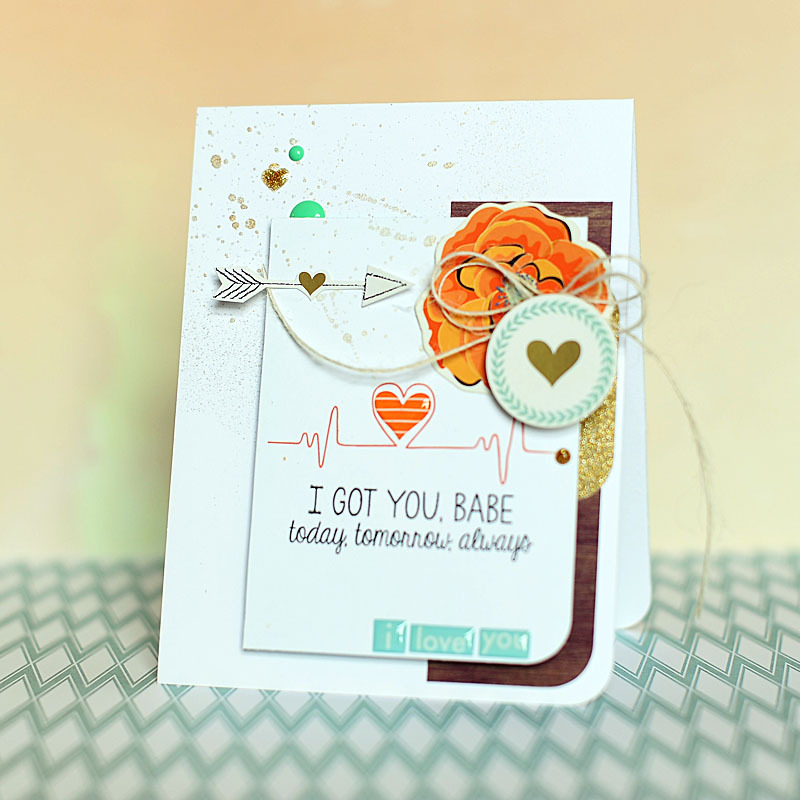 I hope that you'll join in with us for the challenge this week, and be sure to head on over & check out the blog post, because Roree's card is amazing!! That is all I have for you today!! I hope that you have a wonderful rest of your Thursday! Happy Friday, blog friends!!! 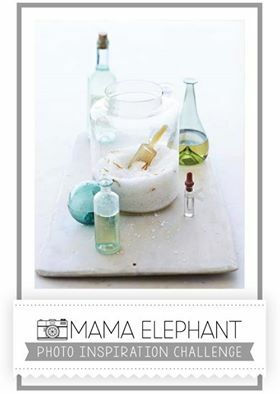 Today I have a card to share with you for this month's Mama Elephant challenge!! Isn't that a beautiful inspiration photo?? I used the Mama Elephant "True Friend" stamp set for my card, but turned it into more of a love card than a friendship card. I combined it with the Glitz Design "77" collection, and this is what came of it! 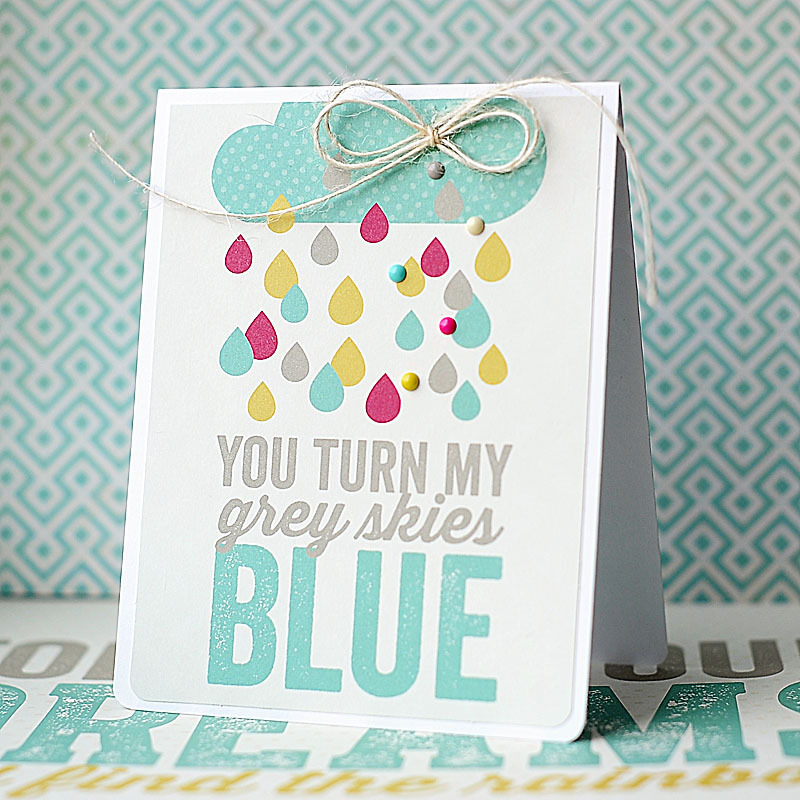 I love how this card turned out...it is nice & simple, but I love how the stamps mixed perfectly with the papers!! 3. No limit to how many entries, in other words, go buck wild! 5. PRIZE: A SPOT ON THE ME CHALLENGE TEAM!!! That is all I have for you today! I hope that you've enjoyed my post! I will be back home in Fargo this coming Sunday...and my crafting time will get back to normal! Can't wait to be creating again on a regular basis!